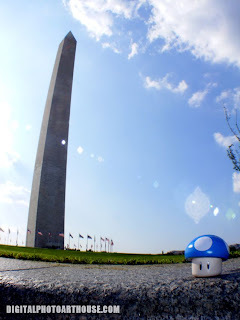 Traveling Mushroom: Washington Monument - Washington, D.C.
Washington Monument - Washington, D.C.
A short but longer than it should have been 9 hour road trip followed by a 45 minute ride on the Washington area Metrorail finally arriving in downtown D.C. to view the sights. The first stop would be the easily recognizable Washington Monument. This was a beautifully lightly covered cloudy sky August day. One could not paint or ask for a better day to view the nations national monuments. For some who don't know, construction stopped on the Washinton Monument due to money and the start of the Civil war and didn't finish until 30 years later. It's because of this that about 150 feet up can you see a slight discoloration where the construction re-began. Labels: D.C., monument, Washington, Washington D.C. The Lincoln Memorial - Washington, D.C. The White House - Washington, D.C.